One way of sustaining the abalone without plundering the ocean is to establish abalone farms. Abalone are naturally adapted to turbulent open sea conditions and can only be held in circulating, high quality, well oxygenated fully-marine sea water. 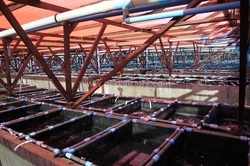 In land-based abalone aquaculture, oceanic water is flushed through a system of plastic trays or concrete raceways via pumps. This control of environmental factors optimizes growth rates, whilst minimizing any potential environmental impacts. The coastline around Hermanus forms the core of our abalone farming industry. The South African abalone (perlemeon), Haliotis midae, is one of the largest molluscs on the planet, attaining a weight of nearly 2kg and a ripe age of nearly 20 years. Abalone are shellfish of the univalve family, meaning they only have one shell, unlike bivalves, such as clams that consist of two shells. Most abalones live in shallow waters and grow very slowly. 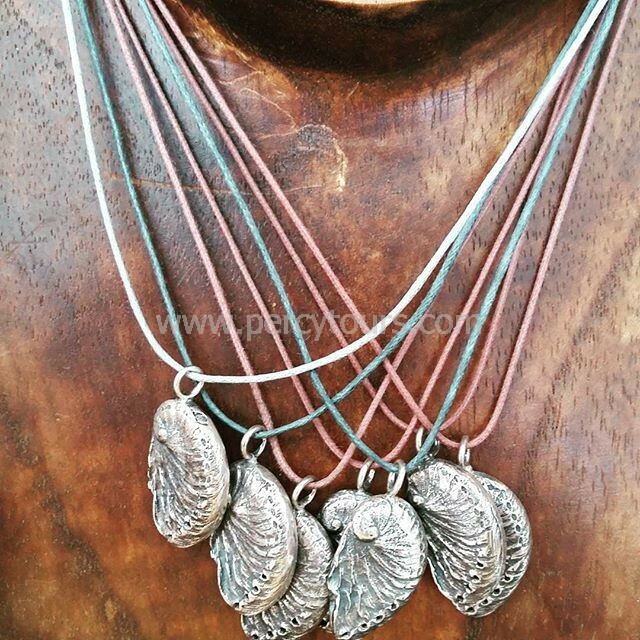 The inner shell of abalone, which has an iridescent green, blue, or pink sheen, is a source of mother-of-pearl. Abalone inhabits the kelp forests of the temperate west and south coast. It reaches densities of up to 50 individuals per square meter. Male abalone release clouds of sperm into the water, triggering the release of eggs by the females. For fertilization to take place, sperm and egg have to meet in the water column. Abalone reach sexual maturity at a small size, fertility is high and increases exponentially with size. They only start spawning from ten years old and the majority is poached before they reach this age. A 1.5 inch abalone may spawn 10,000 eggs or more at a time, while an 8 inch abalone may spawn 11 million or more eggs. Abalone eggs and larvae are consumed by filter-feeding fish and shellfish. Predators of juvenile abalones include crabs and lobsters. 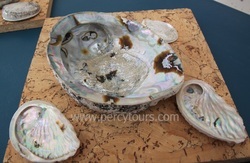 Abalone shells are rounded or oval with a large dome towards one end. The shells have a row of respiratory pores. The muscular foot has strong suction power permitting the abalone to clamp tightly to rocky surfaces. 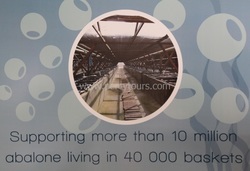 Experience the unique world of abalone farming, with a Guided Tour of the fascinating facilities. Visit the hatchery, the feeding, tank cleaning and sorting of abalone. 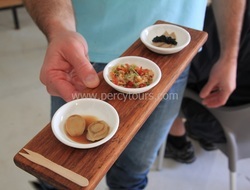 Your tour ends with an (optional extra) tasting of our rare delicacy. Known as - Mother of Pearl – or – Nacre. Like pearls, nacre is secreted by cells of the mantle tissue of certain species of molluscs, it is continually deposited onto the inner surface of the shell (nacreous layer, commonly known as “mother of pearl”), and acts both as a means to smooth the shell itself and as a defense against parasitic organisms. 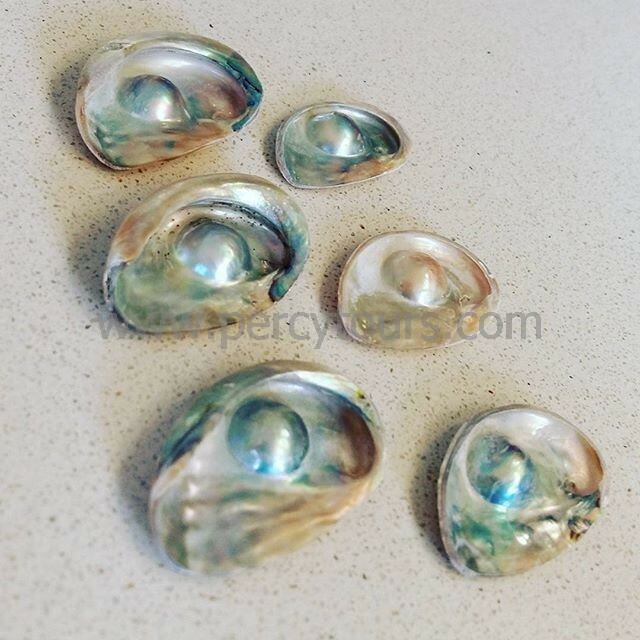 Mother of Pearl is considered highly attractive by many cultures and is often used in making jewellery or inlays in wood furniture and guitars.